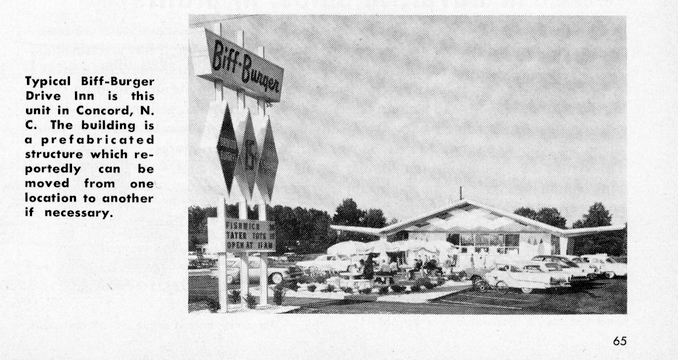 The Original Biff Burger Drive-In! National Biff-Burger System, Inc., Tampa, Fla. recently opened new outlets in Fayetteville, N.C. and Columbia, S.C. According to the company, plans call for additional openings in Atlanta and in Tallahassee, Orlando and Tampa, Fla. The firm reports its new units feature a prefabricated steel building which is towed to its site and erected within two weeks after delivery. The 40 by 10 by 10-foot structures are furnished to the franchisee with kitchen and all supplies and equipment, it is reported. According to the firm, a franchise package sells for a down payment investment as low as $13,500, with additional financing provided by the company.